One of the best grifter entertainments to occur this session is over Governor Walz’s proposed 20 cent gas tax increase (phased in). We’ll start with this wonderful game of three card monte. 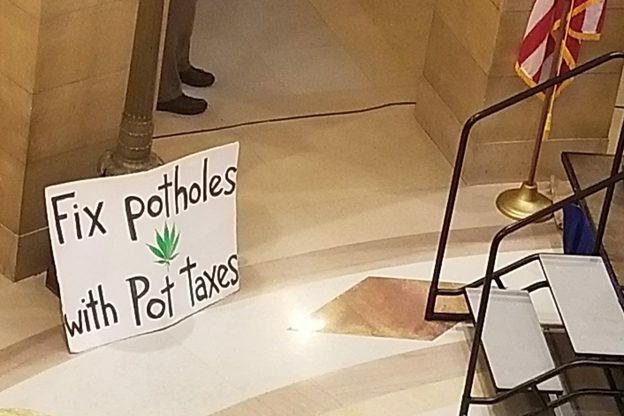 It will undoubtedly come as a surprise to Jason, and maybe to the entire Republican Caucus, to learn that we already contribute sales taxes from these items, and auto registration fees, too, to the highway trust fund. Even with the current gas tax, it obviously isn’t enough. Okay, say the Republicans, We’ll raise the gas tax, but we’ll make it voluntary. Sen. Rarick is in on this one, too. The state’s newest senator is proving to be a veritable cornucopia of harebrained ideas. A chickadee checkoff for potholes, it could work, thinks Jason. Well, obviously even Jason doesn’t think it would work. At least I hope he doesn’t think it would work. I’ll bet the people over at the Revisor’s Office muttered dark oaths under their breath helping bang this one into shape for introduction. This all comes down to the fact that Republican legislators and their constituencies want to maintain and expand our transportation system, but they want somebody else to pay for it. Anybody else. The modern Republican Party is an assembly of pikers and scrubs. It is an undisputable fact that metro tax gas tax collections already subsidize rural projects. And the subsidy isn’t even limited to transportation. I’ve already gone through the exercise of discussing another proposal for an alternative for paying for transportation, the sales tax, in If you pay the gas tax, at least you own a car. Former Revenue Commissioner John James suggested we could pay for our transportation needs by getting rid of the gas tax and expanding the sales tax to food, clothing, and services not already taxed. I pointed out in that story that under current sales and use tax law, about 7% of the entire general fund budget of the state (which doesn’t include transportation trust fund spending) is already paid for by Hennepin County sales taxpayers alone. James’ proposal would shift an even greater percent of the state’s tax burden to the metro areas. The state’s cities are the engines that drive our economy; it isn’t surprising that they subsidize greater Minnesota. It isn’t even especially objectionable to me, but don’t take us for saps, Jason.